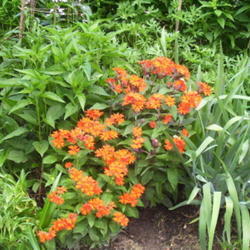 Dedicated gardeners often want to know the identity of the plants they purchase and grow. That means knowing formal plant names. These names always have a botanical part and this is often followed by a horticultural part. This article is about the botanical part of plant names. In botany, naming plants (called plant nomenclature) is closely associated with classifying plants (called plant taxonomy). Classifying plants comes before naming them and reclassifying plants frequently comes before renaming them. Consequently, awareness of the naming and names of plants comes from some awareness of their classification. The fundamental unit of biological classification is the species (the word is both singular and plural). A species is traditionally identified when members of that species are recognized in the physical environment. The individual members of a species look very similar to one another, the similarity being based fundamentally on close genetic similarity. Membership in a species can be assigned on the basis of an ability to interbreed and produce fully fertile offspring. Nevertheless with plants, hybridization between closely related species is a common occurrence both in nature and horticulturally. At the present time, molecular methods are the major impetus to plant reclassification. The traditional classification of plants and animals is based on the work of the 17th century Swedish botanist and taxonomist, Carl Linnaeus. In his classification, Linnaeus grouped all of the plants and animals known to him into seven categories of increasing rank. He took species as the lowest and most exclusive of these categories. Linnaeus grouped similar species into a genus, the second rank in his hierarchical classification, similar genera into a family (the third rank) and so on. Groupings at lower, compared with higher, taxonomic levels are now taken to indicate closer phylogenetic relationship. In his system for naming species, Linnaeus used binomial nomenclature, whereby a species name consists of two words. In botany, the species names are termed binomials. The first part of a species binomial is the name of the genus the species belongs to. The second part, called the species epithet, is the specific (species) designation itself. Species epithets frequently contain descriptive information about the species. Species binomials are botanical names, which can therefore be termed scientific names. Linnaeus' book "Species Plantarum" ed.5 (1753) is taken to contain the first validly published plant names. This book is the main starting point for the International Code of Botanical Nomenclature (ICBN), which is a set of rules and recommendations dealing with the formal naming of plants. Linnaeus named spring vetchling or spring pea O robus vernus (see right). In recent times, the species previously assigned to the Genus Orobus have been reclassified into three different genera. As stated, the name of a species is a binomial which includes the name of the genus the species belongs to. Thus changing its genus, changes the name of the species. This excellent spring perennial is now named Lathyrus vernus. The ICBN recognizes and allows three levels of botanical classification below the species level; namely, subspecies, varietas (variety) and forma (form). It does not define these terms, but only specifies their relative ranks, decreasing as per the order given here. Compared with assigning individual plants to a species, there is a subjective component to assigning plants to one (or more) of three lower levels of classification. With formae, the difference involved may be so small as to be of dubious taxonomic significance. When infraspecific (below the species) ranks are assigned, the particular rank is indicated by the relevant abbreviation; namely, subsp., var. or f.. An example is Gentiana septemfida var. lagodechiana. The latter type of name is called a trinomial. The purported ancestor of the garden pea is a plant native to the Mediterranean region and beyond. It has been named with the quadrinomial, Pisum sativum subsp. elatius var. elatius. Along with other European academics of his day, Linnaeus wrote in Latin. Consequently, some of the words he used in names were Latin words and the others were latinized words (put in Latin form). The binomials were constructed to follow the rules of Latin grammar. This tradition is usually continued in the botanical part of a plant's name; for instance, the binomials for the species Jacob's ladder, northern Jacob's ladder and Japanese Jacob's ladder are: Polemonium caeruleum, Polemonium boreale and Polemonium yezoense, respectively. In fact, where Latin vocabulary did not exist, later scholars created new Latin words. The Romans themselves borrowed many Greek scientific words and, in turn, the academics who used "New Latin" coined many scientific terms using Greek. Rocky Mountain penstemon (see right) is Penstemon strictus. The word penstemon has its origin in Greek, though there seems to be some confusion concerning the words which were used. One version is "penta" (five) and "stemon" (thread), the other "paene" (almost) and stemon. Either could refer to the prominent infertile fifth stamen that is distinctive of the Genus Penstemon. The origin of the confusion apparently goes back to Linnaeus himself. 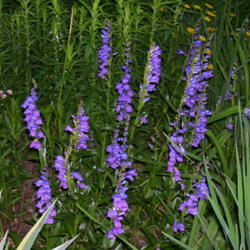 In 1748, he called a plant, now identified as a species of Penstemon, simply Penstemon. In the all important 1753 publication, he included the same plant as Chelone pentstemon. 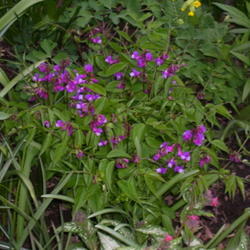 The Genera Chelone and Penstemon are closely related. In Latin, "strictus" means tightened. According to the ICBN, the first letter of all botanical names, from the genus level up, must be capitalized. Since species binomials begin with a genus name, the genus part of a binomial is always capitalized. With a few exceptions, the second part, the species epithet, must not be capitalized. The ICBN itself recommends never capitalizing the species epithet. Abbreviations of all botanical names, from the genus level up, are not permitted. The single abbreviation allowed is at the species level. In this case, it is the genus part of the species binomial that can be abbreviated to the first capital letter of the genus name, followed by a stop. This is allowed in a piece of writing, once the genus part of the name has been written in full. Thus the above Polemonium species names could be written more succinctly as Polemonium caeruleum, P. boreale and P. yezoense. In writing, it is a common convention to italicize (or underline) species binomials. Italicizing the names of genera and binomials and trinomials may be done as an academic publication requirement. The ICBN itself italicizes names at all taxonomic ranks. In its Preface, however, the ICBN is explicit in not mandating italicizing, though it does suggest extension of its own usage. The ICBN also contains instructions for the option of citing the name of the authority, the author who published the first description of a plant and gave it it's name. The name of the author further identifies the plant, but is not usually used in horticulture. Penstemon strictus Benth. is an example. The names are often abbreviated following a recommended list. Benth. is the 19th century botanist George Bentham. ICBN uses of parentheses are of little or no significance to gardeners. Nevertheless, it can be very helpful to have, following the name of a renamed plant, the old name which was replaced. Research done in the 1990s indicates that almost all of the North American species members of the Genus Aster are less closely related to the Eurasian species members than previously thought. Thus most of the well known fall asters have been removed from the Genus Aster and assigned to a Genus Symphyotrichum; for instance, New England aster is now Symphyotrichum (Aster) novae-angliae. On the other hand, white wood aster was found to be less related to the others and is Eurybia (Aster) divaricata. Stokes' aster was found to be more related and is Symphyotrichum (Stokesia) laeve. Reclassification is not the only reason why plant names are changed. They may also be changed because the existing names are incorrect or because plants were misidentified. When correcting well established names can cause widespread confusion, as happens when plants are widely used and economically important, the ICBN has provisions to avoid making the correction. This happened in 1999, when the name of the Genus Chrysanthemum was not changed to Dendranthema which had priority. Part of the resistance to recognize such a change came from the fact that Chrysanthemum is both a botanical and an everyday name. As already mentioned, hybridization is common b etween closely related plant species. In horticulture, it has also been used extensively to produce new and better plants. Lychnis xarkwrightii ('Orange Zwerg' (Orange Dwarf), see right) is a hybrid of Lychnis chalcedonica and Lychnis xhaageana, latter also a hybrid. In addition to interspecific hybrids (between member species of the same genus), intergeneric hybrids (between species belonging to different genera) also occur. Commensurate with the greater parental genetic distance involved, intergeneric hybrids are much rarer. The ICBN contains rules and recommendations for naming hybrids. Adding multiplication signs is the method commonly used in horticulture to indicate hybridizing. The ICBN has two options for using these to name hybrids; namely, hybrid formulae or new names. With either interspecific or intergeneric hybrids, hybrid formulae are constructed by placing a multiplication sign between the species binomials, as in Digitalis lutea x Digitalis purpurea. Such formulae can be constructed at other taxonomic levels. For interspecific hybrids, a new species binomial consists of the common genus name of the two parents and a new species epithet. The multiplication sign precedes the species epithet and is closer to that than to the genus part of the binomial. An example is Dianthus xallwoodii, hybrid of Dianthus caryophyllus and D. plumarius. For intergeneric hybrids (two parents), a new species binomial consists of a new genus name, made by condensing the names of the two parent genera, and a new species epithet. The multiplication sign precedes the new genus name. An example is xHeucherella tiarelloides, hybrid of Heuchera sanguinea and Tiarella cordifolia. A multiplication sign is not part of a name. All offspring of the same parent species will have the same botanical name. Sometimes, sterile individual hybrid plants can become fertile through tetraploidy (the chromosome number doubling). Such a mechanism is believed to have been important in the evolution of plants. This is how the horticultural species Digitalis xmertonenis arose from hybridization between Digitalis grandiflora and D. purpurea. In such a case, using an x in front of the species epithet is optional. After all of the above, it may be well to remind gardeners of the value of precise rules of botanical nomenclature for gardeners. Unlike the common names of plants, a current species binomial identifies one and only one plant species to anyone, in any region, in any language, anywhere. A precise name permits precise communication, retailer-to-gardener, writer-to-gardener and, of course, gardener-to-gardener.